The fruit for Pio Cesare’s Barbera d’Alba comes from family-owned vineyards in Serraluga d’Alba (Ornato and Colombaro), Sinio, Diano d’Alba, Monforte d’Alba and Grinzane Cavour, along with vineyards belonging to families who have sold grapes to Pio Cesare for generations. These suppliers work their vineyards according to the winery’s directions and strict quality controls. The must saw up to 25 days of skin contact in temperature-controlled stainless steel. Following fermentation, the wine is moved to French oak for 12 months, 30% in medium-toasted barriques and 70% in large oak casks. The Barbera grapes grown in the Barolo region produce a finished wine with a full structure and plummy, spicy, complex flavours. 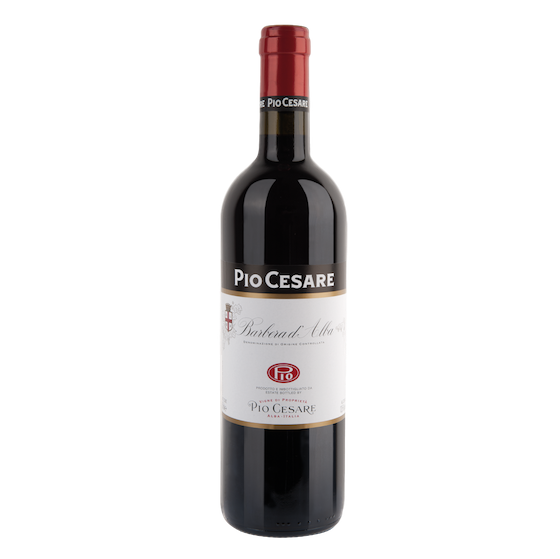 Pio Cesare’s Barbera plots are found in south or south-east facing vineyards rooted in limestone, clay, and sandstone. The sun and warmth captured at these sites produces fruit with well-developed skin tannins, colour, and flavour compounds. You’ll find blackberry aromas, as well as a hint of toasted tobacco and oak spice. This is a Barbera with the potential for a long life.